"Yahoo Local is One of The First Sites I Scrape - and You Should Too." Yahoo Local is one of my favorite sites to scrape data from. Unlike other sites their pages load quickly and provide just as much or more information as Yelp and Google Maps. Its always one of the first websites I scrape for data and it should be one of the first sites you use also. 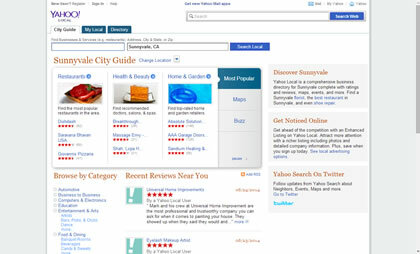 Scraping Yahoo Local is a great way to gain valuable business data. They may have redesigned their site many times over the years but each update makes them better. Yahoo Local even provides some information that other sites like Yelp and Google Maps do not provide, data that you could be leveraging to your advantage. Scraping data from Yahoo Local is no more difficult than scraping data from any other website, and with Local Scraper all you need to do is press one simple button to start collecting data. If you are interested in scraping data from Yahoo Local I highly recommend clicking the button on the left to learn more about scraping data for your business. Here is some data you could be scraping from Yelp. Our amazing Yahoo Local Scraper is included with our Local Scraper Package.